Baby 8 Months Old - Delayed Development and Head Injuries! Greetings! This week your bundle of joy has turned 8 months old. It is a very beautiful feeling to see him grow each day. Your baby has become an integral part of the family spreading smiles everywhere. Baby development is a very interesting thing to learn as nature has its way around here and it teaches each child to survive, nourish and grow itself. This month your baby is sitting all by himself and looking at everything at a new level. The scope of his vision has increased as he no longer sees the ceiling all day, he can turn himself towards the direction of sound and light. He also responds if you call out his name and may give you a big gummy smile or a squeal of recognition. These days your baby has no trouble getting around even if the mode of transport is creeping on the floor and stationary crawling position. You will see your baby 8 months old experimenting with his hands and legs trying to put one forward and propel himself forward. Few days of practice and the cute crawl will arrive. Then you can expect him to be all over the house. Developmental milestones are an indicator that your baby is growing well and they are seen around the same time in most babies. If any milestone is delayed you need not worry as every baby is unique and grows at his own pace. Let us now learn in detail what your baby will do in this month. Feeding: As you begin feeding the baby you will need to innovate. You may be thinking what to feed my 8 month old. By now your baby will have the front two teeth so he is still fit only for mashed up and semisolid food. You could give him home made purees or opt for packaged baby food for 8 months old baby. In either case you should take care with the sterilization and use only cleaned and boiled vessels. 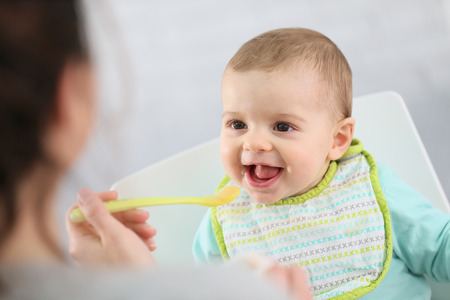 The spoon that you use should have a long handle and blunt edges with a small scoop so that it fits the baby’s mouth nicely. Sleep: 8 month old sleep is very much like the previous month and it gets better with each month as the baby is tired with all the activity and moving around. Good feeding and an active day help the child to sleep better. Vision: Your baby’s eye sight is at its best and he can now distinguish colors and clearly see and recognize across the room. The near sighted vision is still better than that for far off objects. Movements: Your baby 8 months old is fascinated by toys and apart from that he also loves throwing, shaking and banging them just to see what happens next. Gradually he will observe and learn the different functions. He will put a cup to his mouth as he understands that it is used to drink. Crawling is his favorite thing by now and he is loving the newly found mobility that gets him from here to there so quickly. Sitting on his own is also now an effortless task and he is already good at doing it. Having a baby can change your routine drastically but there is one more thing that changes a little and that is your relation with your spouse. It is not uncommon to have a feeling that you two have drifted apart and are not able to spend as much time together as before. It is just because of the hectic routine where both of you are equally burdened with your duties. Acknowledge this fact and take efforts to spend time together. Make plans for a weekend night and leave your kid with your parents. Spending quality time can heal those stressed out feelings. Also talk about your duties and divide them. Spending some time just talking with each other without discussing undone works and baby chores will help you deal more efficiently with this situation. Keeping up with a baby on the move can also be exhausting for you as you will spend a lot of time just ensuring that the little one does not hurt himself or fall from the stairs. Put your baby in the play gym for a while and sit down to get some me time. Take your partners help and learn to make time for yourself. These are the growing stages of a baby and very soon your baby will become independent so enjoy this phase together with your spouse. Developmental delays: We already know that every child grows at its own unique speed. However we need to know and learn about developmental delays. These are basically delayed developmental milestones like sitting, crawling, teething, walking etc. Some children tend to pick up gross motor skills sooner than others. Some talk early and others start crawling and walking before the age of one. All of these are considered normal. Delayed talking is at times a matter of concern because it means that the child has insufficient exposure to communication by adults or a hearing problem. In rare cases the cause behind such delays could be autism or spina bifida. As parents we tend to get worried about baby milestones, but as long you see new changes in your little one each day, all is good. If there are some observations that worry you, note them down and talk to your pediatrician about it. Flat spot: Many babies tend to develop a flat spot on the scalp as they most part of the day lying down. This is called as positional plagiocephaly. It is not a serious problem and tends to correct itself. When the baby 8 months old begins to sit and the head is no longer contact with the floor or bed all day, the shape gets rounded again. Some people believe that using a mustard seed pillow for the baby gives the perfect shape as it avoids positional pressures. You should make the baby sleep with the head straight rather than on one side. 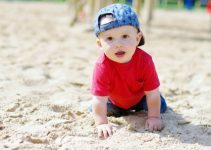 Accidents and Poisonings: These days your little one is on the move all day and he will test his limits and try to reach for whatever attracts him. The problem is that he cannot distinguish safe from unsafe. What attracts him may even be dangerous for him. So you must take utmost care and baby proof your rooms and remove all dangling objects that the baby can pull on. Store away all toiletries in a locked cabinet or a high shelf as you don’t want your little one getting near those soaps and toilet cleanser. There have been instances where the 8 month old baby boy had accidentally consumed a harmful liquid. Such situations need immediate medical attention and you need to rush to the hospital so that the poisonous liquid can be removed by a gastric wash. Infections: Being mobile and curious will make a lot of unnecessary things land in the mouth making your baby prone to infections. The commonest infections during this time are stomach infections like diarrhea and respiratory infections. Both are pretty common and harmless but you need to keep a check if the loose stools are very frequent, then you will need to supplement with oral rehydration solution (ORS) to take care of the baby’s fluid intake and prevent dehydration. Respiratory infections like cough and cold should be first treated with home remedies and if very severe with symptomatic medications. Head injuries: Each mother is bound to encounter this at some point of time. Children learn to turn, sit, stand and with each new achievement comes a number of falls. Getting a bump on the head is pretty common and you should not panic. The best thing is to calm the baby and immediately apply an ice pack to bring down the swelling. If you notice after a head injury that makes your baby 8 months old drowsy, very cranky or has had an episode of vomiting, then you should contact the doctor immediately as these could be signs of an internal head injury. Take some small steps to prevent a head injury by removing dangerous furniture, fixing the flat screen television so it doesn’t fall, putting up corner guards and gates at the start of all staircases.